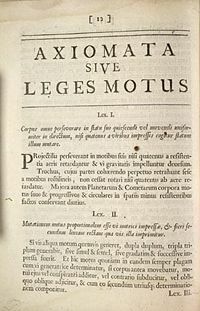 Newton's first and second laws of motion, in Latin, from the original 1687 edition of Principia Mathematica. Mechanics (from the Greek term Μηχανική) is a branch of physics involving study of the movement of physical bodies when subjected to forces or displacements, and the subsequent effects of the bodies on their environment. This discipline, which has its roots in several ancient civilizations, is now subdivided into two main branches: classical mechanics and quantum mechanics. During the early modern period, scientists such as Galileo, Johannes Kepler, and especially Isaac Newton, laid the foundations for what is now known as classical mechanics. The foundations of quantum mechanics were established during the first half of the twentieth century by Max Planck, Werner Heisenberg, Louis de Broglie, Albert Einstein, Niels Bohr, Erwin Schrödinger, Max Born, John von Neumann, Paul Dirac, Wolfgang Pauli and others. Quantum mechanics is now considered a foundational-level theory that encompasses and supersedes classical mechanics. However, classical mechanics is useful for calculations of macroscopic processes, while quantum mechanics helps explain and predict processes at the molecular, atomic, and subatomic levels. Studies in mechanics have made vital contributions to various fields of engineering. They include mechanical engineering, aerospace engineering, civil engineering, structural engineering, materials engineering, and biomedical engineering. Thus, knowledge of mechanics has led to many practical applications. Mechanics is the original discipline of physics and was formerly part of "natural philosophy," dealing with forces and motion in the macroscopic world as perceived by the human eye. This discipline has developed into a huge body of knowledge about important aspects of the natural world. Modern mechanics encompasses the movement of all matter in the universe under the four fundamental interactions (or forces): gravity, the strong and weak interactions, and the electromagnetic interaction. Mechanics also constitutes a central part of technology, the application of physical knowledge for human purposes. In this sense, the discipline is often known as engineering or applied mechanics, and it is used to design and analyze the behavior of structures, mechanisms, and machines. Important aspects of the fields of mechanical engineering, aerospace engineering, civil engineering, structural engineering, materials engineering, biomedical engineering and biomechanics were spawned from the study of mechanics. The major division of the discipline of mechanics is one that separates classical mechanics from quantum mechanics. Historically, classical mechanics came first, while quantum mechanics is a comparatively recent formulation. Classical mechanics originated with Isaac Newton's Laws of motion in Principia Mathematica, while quantum mechanics did not appear until 1900. Both are commonly held to constitute the most certain knowledge that exists about physical nature. Classical mechanics has especially often been viewed as a model for other so-called exact sciences. Essential in this respect is the relentless use of mathematics in theories, as well as the decisive role played by experiment in generating and testing them. Quantum mechanics is of a wider scope, as it encompasses classical mechanics as a sub-discipline that is applicable under certain restricted circumstances. According to the correspondence principle, there is no contradiction or conflict between the two subjects, each simply pertains to specific situations. Quantum mechanics has superseded classical mechanics at the foundational level and is indispensable for the explanation and prediction of processes at molecular, atomic, and subatomic levels. However, for macroscopic processes, classical mechanics is able to solve problems that are unmanageably difficult in quantum mechanics and hence remains useful and well used. Analogous to the quantum reformation of classical mechanics, Einstein's general and special theories of relativity have expanded the scope of mechanics beyond the mechanics of Newton and Galileo, and made fundamental corrections to them, that become significant and even dominant as speeds of material objects approach the speed of light, which cannot be exceeded. Relativistic corrections are also needed for quantum mechanics, although relativity has not been fully integrated with it yet. This is one of the hurdles that has to be overcome in developing a Grand Unified Theory. The often-used term body needs to stand for a wide assortment of objects, including particles, projectiles, spacecraft, stars, parts of machinery, parts of solids, parts of fluids (gases and liquids), and so forth. Other distinctions between the various sub-disciplines of mechanics, concern the nature of the bodies being described. Particles are bodies with little-known internal structure, treated as mathematical points in classical mechanics. Rigid bodies have size and shape, but retain a simplicity close to that of the particle, adding just a few so-called degrees of freedom, such as orientation in space. Otherwise, bodies may be semi-rigid, that is, elastic, or non-rigid, that is, fluid. These subjects have both classical and quantum divisions of study. For instance, the motion of a spacecraft, regarding its orbit and attitude (rotation), is described by the relativistic theory of classical mechanics. Analogous motions of an atomic nucleus are described by quantum mechanics. The following two lists indicate various subjects that are studied under classical mechanics and quantum mechanics. Acoustics, dealing with sound (or density variation propagation) in solids, fluids, and gases. In addition to the above areas, there is the "theory of fields," which constitutes a separate discipline in physics, formally treated as distinct from mechanics, whether classical fields or quantum fields. But in actual practice, subjects belonging to mechanics and fields are closely interwoven. Thus, for instance, forces that act on particles are frequently derived from fields (electromagnetic or gravitational), and particles generate fields by acting as sources. In fact, in quantum mechanics, particles themselves are fields, as described theoretically by the wave function. Beer, Ferdinand Pierre, E. Russell Johnston, and John T. DeWolf. 2006. Mechanics of Materials. Boston: McGraw-Hill Higher Education. ISBN 978-0073107950. Byron, Frederick W., and Robert W. Fuller. 1992. Mathematics of Classical and Quantum Physics. reprint ed., New York: Dover Publications. ISBN 048667164X. Griffiths, David J. 2005. Introduction to Quantum Mechanics, 2nd ed. Upper Saddle River, NJ: Pearson Prentice Hall. ISBN 978-0131118928. Hibbeler, R. C. 2007. Engineering Mechanics: Dynamics. Upper Saddle River, NJ: Pearson/Prentice Hall. ISBN 978-0132215046. Hibbeler, R. C. 2008. Mechanics of Materials, 7th ed. Upper Saddle River, NJ: Prentice Hall. ISBN 978-0132209915. Messiah, Albert. 1999. Quantum Mechanics. reprint ed., Mineola, NY: Dover Publications. ISBN 0486409244. Munson, Bruce Roy, Donald F. Young, and T. H. Okiishi. 2006. Fundamentals of Fluid Mechanics. Hoboken, NJ: J. Wiley & Sons. ISBN 978-0471675822. Taylor, John R. 2005. Classical Mechanics. Sausalito, CA: University Science Books. ISBN 978-1891389221. All links retrieved September 13, 2018. This page was last modified on 13 September 2018, at 21:59.